As we rightly celebrate the amazing discovery of gravitational waves announced yesterday amidst much fanfare, it’s critical to recognize the work of a stunning diversity of scientists, engineers, technicians and yes, even politicians, who poured forth sweat, toil and tears over more than twenty years to bring to fruition a measurement of almost unimaginable precision and sensitivity. Few quantities were ever unearthed from the soul of the universe with more care and patience. And yet it’s equally paramount to step back for a moment and yet again stand in awe of the man who started it all and appreciate what exactly he did. 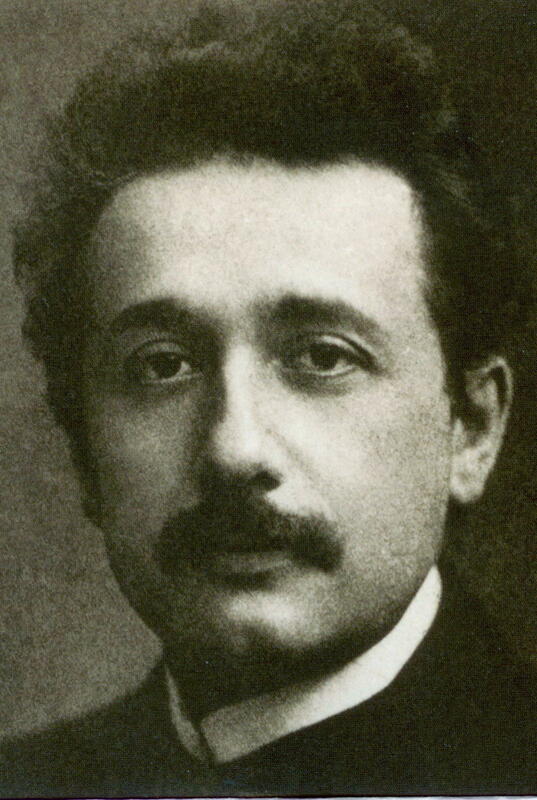 Almost a hundred years ago Einstein put the finishing touches on his so-called field equations which described gravity in terms of the curvature of spacetime. It's an equation which can easily fit on a handkerchief, and yet one whose scope extends over a range of scales which beggars belief, from right here outside earth to the swirling dance of black holes to the entire large-scale structure of the universe. Even as they sat quietly in our textbooks and on our blackboards, those few symbols were orchestrating the workings of planets, galaxies and nebulae like a conductor wielding a baton whose length stretched across the entire universe. Millions of man hours since 1915 have been spent in verifying, testing, extending and stretching every single aspect of those few scribbles, in bringing the accumulated wisdom of two thousand years of building machines and manipulating equations to bear on fulfilling one man’s amazing flights of fancy down to sixteen decimal places. Every one of those hours has validated that man and his fellow human beings’ dreams beyond any reasonable doubt. A rider on a light beam, a flash of awesome insight, a stroke of the pen and suddenly, a key that opened the door to an entire hidden reality filled with hitherto unimaginable wonders, some of which even the maker of that key did not believe in – black holes, neutron stars, gamma ray bursts, gravitational waves. The grand challenge before us now is twofold. The first, longstanding one is to understand how it can possibly be that those few squiggles on a handkerchief describe not only the world that we know but the imagined future that will impinge on our collective consciousness for years to come; it is to figure out what Einstein’s contemporary Eugene Wigner called “the unreasonable effectiveness of mathematics in the physical sciences” (a phrase which must be one of the great understatements of all time). The fact that someone like Einstein can figure out what’s happening around a black hole - an object whose existence he wasn’t even aware of - by writing a few things on a blackboard or a piece of paper should give us all goosebumps. The second challenge asks us to explain something equally amazing: how it is possible that a three-pound mass of blood, flesh and electrochemical impulses can divine those squiggles by pure thought; it is what Francis Crick called “the astonishing hypothesis”. The fact that a diminutive object composed of nothing more than the exact same atoms that constitute chairs, trees and air can evolve through random changes over billions of years and be housed in an entity which can then sit down and write down equations deciphering the symphony of the stars should also give us goosebumps. Answering these two challenges will take all the combined wisdom and intuition that we have gained during two thousand years of scientific and technical exploration, along with completely new kinds of thinking that we can’t even imagine yet. For me these twin challenges are what make our continued existence over the next few millennia seem worthwhile. They are what make my spine tingle. As for Einstein himself, if we had told him that we were still verifying his predictions one hundred years after he made them, I suspect he would have smiled and said exactly what he said then: "If you hadn't found gravitational waves I would have felt sorry for the Lord. The theory is correct." Some of mathematics was designed to describe nature. For example Newton designed calculus to do physics. This is why it's so effective. English, on the other hand, was designed for social interaction, commerce, etc., not for science.